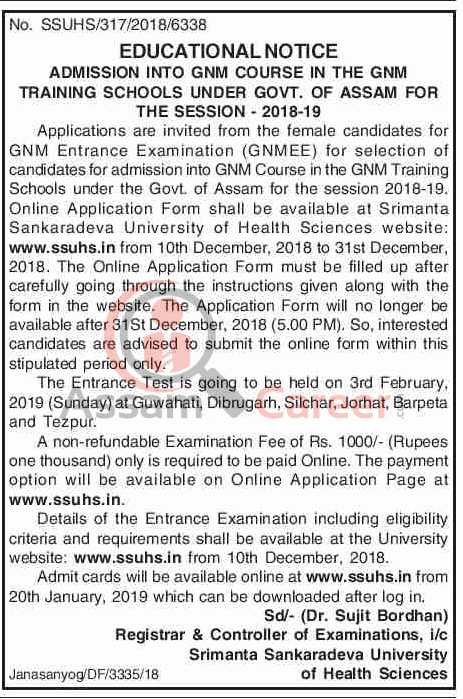 GNM Entrance Examination (GNMEE), Assam. Applications are invited from the female candidates for GNM Entrance Examination (GNMEE) for selection of candidates for admission into GNM Course in the GNM Training Schools under the Govt. of Assam for the session 2018-19. Examination Centre/s: The Entrance Test is going to be held at Guwahati, Dibrugarh, Silchar, Jorhat, Barpeta and Tezpur. Application Fee: A non-refundable Examination Fee of Rs. 1000/- (Rupees one thousand) only is required to be paid Online. The payment option will be available on Online Application Page at www.ssuhs.in. How to apply: The Online Application Form must be filled up after carefully going through the instructions given along with the form in the website of Srimanta Sankaradeva University of Health Sciences website: www.ssuhs.in from 10th December, 2018 to 31st December, 2018. Details of the Entrance Examination including eligibility criteria and requirements shall be available at the University website: www.ssuhs.in from 10th December, 2018. Admit cards will be available online at www.ssuhs.in from 20th January, 2019 which can be downloaded after log in.